Ebookmarketingplus.com LLC is digital ebook publisher and marketing agency. Based in Richmond, Virginia, we publish ebooks, manage marketing projects, and consult to select companies. EBMP has the exclusive rights to Dr. Kolluru Ramakrishna Sarma’s books and papers. Dr. Sarma is a noted scientist, engineer, and university professor. He has worked on the NASA Apollo program and major engineering projects around the world. Professor Sarma taught at Old Dominion University and the University of Virginia. He is the son of Kolluru Somasekhar Sastri, a respected Sanskrit scholar from Andhra Pradesh, India. Dr. Sarma and his family emigrated to the United States in 1965. Other authors include Mohan K. Sarma, a digital marketing leader and EMBA program leader at Virginia Commonwealth University. Most of all, Mr. Sarma has been an ebook publisher since 2011. A hyper-local student project that drove over 12k pageviews in one semester. This site was designed and built by students. Then, all content was written and edited by the student team. Furthermore, all of the social media posts followed a strategy defined by the team’s leader. Finally, the team explored several ways to earn revenue using digital downloads. First, we design authentic Sanskrit phrases to motivate real yoga lovers. Then, every design is approved by Dr. Sarma, our Guru. SYW uses a print-on-demand technology where the customers can select their size and color from an online distributor they trust. Currently, our t-shirts are available now on Merch by Amazon. A new website dedicated to using marketing technology to drive small business success. 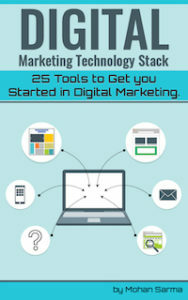 Our first product is the audiobook based on the Amazon ebook Digital Marketing Technology Stack: 25 tools by Mohan Sarma (read by the author). The digital marketing e-learning website for small businesses. Vidjaa is the online resource for tips and tricks to growing your small business. Say ‘YES’ to digital marketing knowledge. Mohan Sarma (aka Butch Sarma) is a consultant for numerous companies including robot distributors, crowdfunding investment portals, physician authors, various software tools and ecommerce sellers. His consulting work includes strategy, product-market fit, branding, digital, and ecommerce. Most noteworthy, Mr. Sarma is a US Army veteran. If you would like to discuss an ebook, consulting, or marketing project, please contact us.